The Oxford Poverty and Human Development Initiative (ophi) recently released its report on poverty levels across the world. The report uses the Global Multidimensional Poverty Index that takes into account deprivations in health, education and living standards. Thus, according to this index, a poor person is called “multidimensionally poor”. Its findings based on data from across 103 low- and middle-income countries suggest that children represent 48 per cent of the multidimensional poor in the world. And half of India’s children are multidimensionally poor. We tend to study poverty figures in general terms. There is not much focus on child poverty even though various global development goals revolve around the welfare and well-being of children. Worryingly, children account for just 34 per cent of the 103 countries’ total population. It means children are poorer than adults. 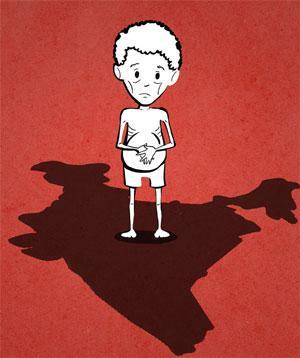 Expectedly, a significant percentage of the poor children are in South Asia and Africa. The younger a child, the deeper is the level of poverty. According to this report, children up to nine years of age are the poorest. For a country that gives an impression of talking less and less about poverty despite hosting the largest number of poor in the world, this report should be an urgent call for action. This is because the assessment is not a usual "income poverty" assessment. It takes into account 10 indicators that define a healthy child like access to health, education and living standards comprising nutrition and sanitation. A child is termed multidimensionally poor if s/he is deprived in one-third or more of the indicators. Thus, this poverty assessment makes a statement on the basic human development situation that children are exposed to. Half of our children being poor under this assessment means they are not able to access basic human development needs. Ideally, this assessment shows that all the government programmes targeted at children are failing to show the desired results. In India, a child is protected with various development programmes from conception to adulthood. Most of these programmes aim to lessen malnutrition and protect food security for children. Why have we failed then? There is no state-level disaggregation of the data in the ophi study. But if one goes by the geography of poverty in India, most of these children will be found in states like Jharkhand, Odisha, Madhya Pradesh and Chhattisgarh. And in all likelihood, they will be from marginalised Scheduled Caste and Tribe groups. These are the states rich in natural resources like forests and water. Some years ago, the Chronic Poverty Research Centre brought out a series of research publications on why some areas in the country remain poor despite years of targeted development activities. These reports clearly showed that access to and use of local natural resources critically decides whether a person would be poor or move out of the trap in future. One research paper convincingly argued that people who live near forests are prone to be chronically poor. It also said that the chronically poor have a "high probability" of transmitting their poverty to the next generation. Are today’s poor children the next generation mentioned in the study? If yes, it calls for a massive change in the design of development programmes. Our programmes for children are ad hoc in approach; they don’t treat the causes of poverty. Instead, they just focus on arranging a few facilities that treat deprivations in short term. So, a child gets nutrition supplements but will not get access to the wholesome food s/he once used to access from the forest. For this problem to be fixed, the government has to change forest laws, the mechanism of the public distribution system and also the approach to poverty as a national challenge.